India has begun its first human trials of an Aids vaccine, the country's health minister has said. The tests in the western city of Pune will involve 30 HIV-free volunteers between 18 and 45 of both sexes. India's HIV/Aids population of more than five million is the world's second largest after South Africa. Human trials have already been carried out in the US, Europe and Africa but the mutation of the virus has hampered the discovery of a successful vaccine. Indian officials said the first phase of the Pune trials would last between one and two years but added that a successful vaccine might still be eight to 10 years away. Health Minister Anbumani Ramadoss said: "We've started the first phase of clinical trials, but 85% of our focus is still going to be on prevention. "Developing a vaccine to prevent Aids is one of the most difficult scientific challenges of our time. It is also one of the most urgent health needs." NK Ganguly, director of the state-run Indian Council of Medical Research, said the vaccine would stimulate an immune system response that might provide protection against infection. "The volunteers have been made aware of the risks involved, they have been counselled and their health status will be monitored all the time," Mr Ganguly said. The tgAAC09 vaccine was developed by Targeted Genetics, based in Seattle, and the Columbus Children's Research Institute. 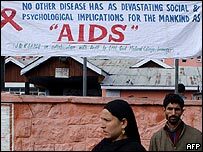 Many analysts fear India's estimate of five million living with HIV/Aids could be too low, as people may be infected without knowing it. "There are 68 new cases of HIV every hour," said SY Qureshi of India's National Aids Control Organisation.